Dr. Joel Yaphe, University of Toronto’s Emergency Medicine Residency Program Director and Dr. Indy Ghosh discuss the difficult diagnostic dilemmas when faced with a patient with acute monoarthritis. They review how to distinguish clinically between septic arthritis and gout and which aspects of the presentation and work-up are the most reliable in risk stratifying patients. The key differential diagnosis of Acute Polyarthritis can be even more of a challenge, but fear not: by then end of this podcast and post you will be able to recognize the key diagnoses, how to work them up, and who needs consultation. Joel Yaphe and Indy Ghosh discuss such questions as: What are the most predictive signs and symptoms of septic arthritis? How does serum WBC, ESR and CRP contribute to the probability of septic arthritis? Should we still be performing arthrocentesis on patient’s with overlying cellulitis? How can you tell the difference between septic bursitis and septic arthritis? What does the literature tell us about how useful the synovial fluid tests are in ruling in or ruling out septic arthritis? What is the role of bedside ultrasound in septic arthritis? Is there a role for steroid therapy in septic arthritis? When would you consider oral NSAIDs vs oral prednisone vs intra-articular methylprednisolone for the treatment of Gout? Is there a role for colchicine in the ED treatment of Gout (AGREE Trial)? 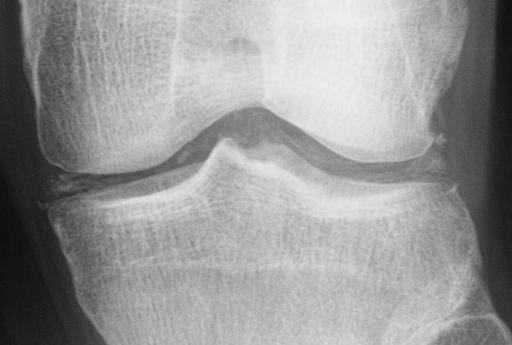 What is acute calcific arthritis of hydroxyapatite disease? How can one distinguish Reactive Arthritis from Septic Arthritis clinically? and many many more…..
Classically presents with an acute hot swollen knee or ankle, constitutional symptoms including fever, non- weight bearing with severe pain on passive ROM of the joint. However, septic arthritis can occur in any joint, can occur in the absence of fever, and subtle signs typically occur in immunocompromised and elderly patients. 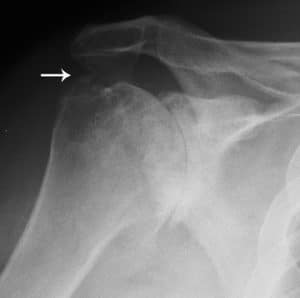 Distinguishing RA flare from Septic Arthritis: in the context of pre-existing arthritis, the affected joint or joints will usually show sings that are out of proportion to disease activity detected in other joints. However, joint aspiration is usually required to definitively distinguish septic arthritis from an arthritis flare. How to distinguish Septic Bursitis (image below) from Septic Arthritis: bursitis is extra-articular so pain is not in all planes of joint motion. 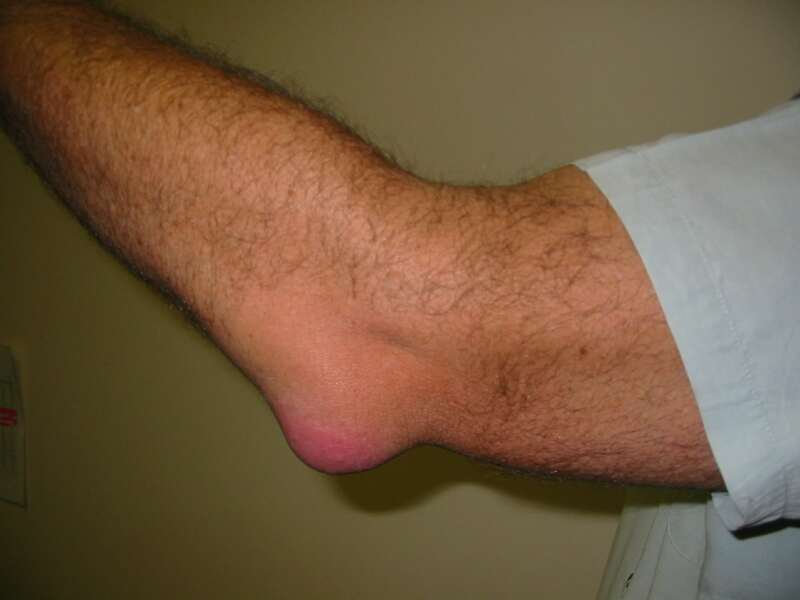 Our experts recommend aspiration of bursitis that you suspect is infectious because if the patient rapidly improves and the culture is negative, a prolonged course of antibiotics can be avoided. 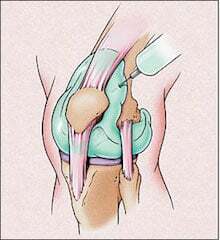 Arthrocentesis is an essential emergency medicine skill that is often diagnostic as well as therapeutic (relieves pain and is part of the treatment in septic arthritis), and has a very low complication rate. Emergency bedside ultrasound was found to decrease pain, total time of procedure and physicians find it easier to perform in a small RCT. For inaccessible joints such as the hip, an ultrasound can be very useful in identifying a joint effusion. Contra-indications to arthrocentesis: consider consult before arthrocentesis if there is an obvious cellulitis overlying the joint in question, prosthetic joint or post-op joint. Most experts will do an arthrocentesis on patients with an elevated INR or a known bleeding disorder but the risks and benefits need to be weighed on an individual basis. Joint WBC and PMNs are the 2 most important lab tests for septic arthritis. The higher the joint WBCs the more likely septic arthritis and the lower the joint WBC the less likely, but strict cut-offs should not be used because studies have shown that about 1 in 4 patients with septic arthritis will have a joint WBC <40,000. 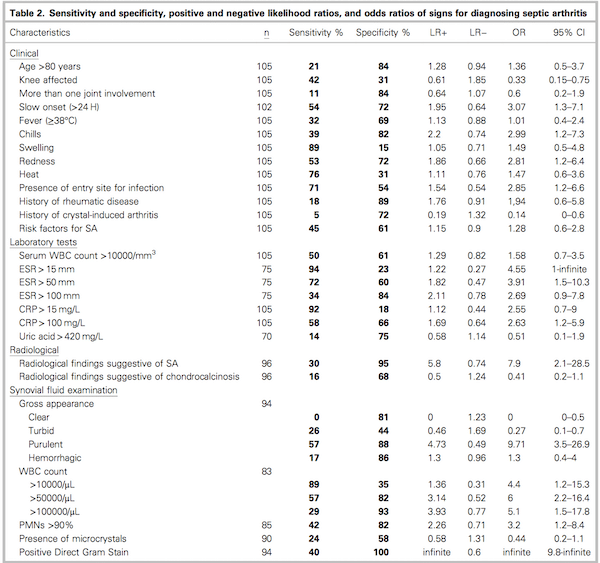 The finding of crystals on joint fluid aspiration does not rule out septic arthritis as 1.5% of patients with arthrocentesis proven crystal disease had concurrent septic arthritis in one study (JEM, 2007 Jan;32(1):23-6). => While there is no single symptom, signs, blood test or joint fluid finding that can definitively rule in or out septic arthritis, patients can be risk stratified (as we do with chest pain patients). Systemic Steroids for Septic Arthritis: While there have been small RCTs in the pediatric population showing more rapid clinical improvement and decreased length of stay with IV Dexamethasone in hip septic arthritis, there is no evidence in adult septic arthritis for the use of systemic steroids, so no recommendations can be made at present. Definitive Management: Serial closed needle aspiration has been shown to be as effective as open drainage of the joint where the joint is accessible and adequacy of drainage can be assessed. Work-up: Urethral, rectal, pharyngeal and skin swabs should be done in all patients suspected of GC arthritis in addition to joint aspiration, as the culture yield on joint fluid is very low and the bacterial diagnosis is most often made from a distant site. Treatment: IV Ceftriaxone 2g q24h until symptoms improve, then switch to oral cephalosporin for minimum of 7 days, plus treat for chlamydia (doxycycline or azithromycin) and notify public health office as well as contacts for assessment. An elevated Uric Acid level in the ED patient with an acute mono-arthritis, while increasing the likelihood of the mono-arthritis being caused by gout, has PPV and NPV that are not good enough to rule in or out the diagnosis with certainty and our experts don’t find it useful in their decision making. Elderly patients with gout: more likely to have polyarticular gout, a more indolent course, tophi and upper extremity involvement. Do not interrupt the use of Allopurinol or diuretics in patients who come to ED on allopurinol or diuretics unless they have just very recently been started on it, as stopping allopurinol may cause fluctuations in uric acid levels that worsen gout. Next, identify patients who are systemically unwell and/or have non-MSK organ involvement as they require further work-up and usually an admission. Reactive Arthritis: ‘Reiter’s syndrome’ an acute arthritis caused by a preceding GU (eg: Chlamydia) or GI bacteria (eg: Camplylobacter) and recently C. difficile with the classic triad of urethritis, conunctivitis and arthritis (although majority will not have classic triad). Other clinical clues are Enthesitis and axial joint involvement. Sarcoidosis: systemic disease that can affect any organ but commonly occurs in young pt with lower extremity mono or oligo acute arthritis with tender papular rash on the shins – erythema nodosum (see image below). Look for nodular granulomas on CXR. Dr. Japhe and Dr. Helman have no conflicts of interest to declare.